John Walters was born in 1894 in Limerick he was the third youngest of Timothy Walters and Bridget Toohey’s eleven children, and one of only four who survived to adulthood. His brother Frederick Walters was the father of the founder of the well known limerick company Ger Walters Fuels. The other three who had reached adulthood were his two older brothers Jeremiah (known as George), Timothy and his younger brother Frederick. In 1911 John and Frederick were living with their parents in Monabraher, near Watchhouse Cross (1911 census record pdf). John was working as a general labourer at the time, though with in the year he would follow his two older brothers into the armed forces. The letter below shows how tough it was to survive even when getting a “proper” wage in 1912 as John needed to send his brother a bailout letter. Though as can be seen this was quickly retracted. George had returned to Limerick from Wales, his daughter Edna was born in Wales in 1909, His daughter Della was born in Limerick in 1912, by 1914 the family were in Scotland where their son William was born. This nomadic lifestyle was typical of army life during this period. To George Walters 4 Quarry Road, Thomondgate, Limerick. George just a line don’t bother what I asked you for got two shill today in allowance sorry for troubling you. How is all getting on let me know in next. Hoping to hear from you soon. 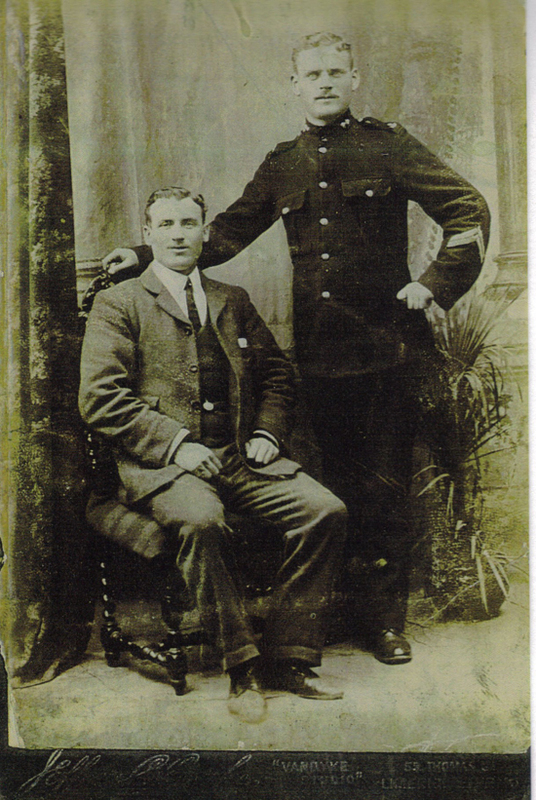 John Walters in his uniform prior to leaving for war, with his brother George Walters. With the out break of World War One, all four brothers found themselves in the trenches. Sadly not all of them would return home. 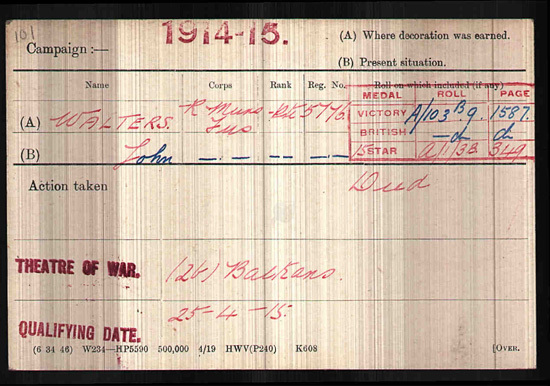 John Walters was a Private (5776) with the Royal Munster Fusiliers fifth battalion. This was the same battalion in which his brothers George and Frederick served. John was reported as missing in action on the 21st of August 1915 at the Dardanelles engagement where he was presumed killed as his body was never recovered. He was stated to be from St. Munchin’s Parish, Limerick. 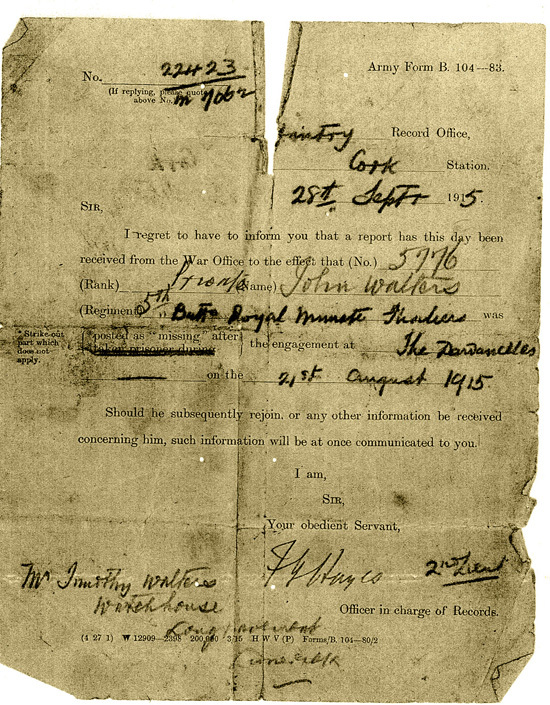 After his death another letter would arrive in Limerick which provided notification of John’s presumed death through being missing in action. This letter was sent to his father Timothy Walters at his address at Watch house, Long Pavement, Limerick. The letter was not issued until the 28th of September 1915. John Walters is commemorated along with the others that fell in the Dardanelles on the Helles Memorial, Turkey panel 185 – 190.